The Tunbridge Fairgrounds host more than the town's legendary annual World's Fair; every other June, the Vermont History Expo brings together more than 150 local historical societies, museums and heritage organizations, as well as musicians, authors, genealogists, crafters and other talented professionals, to dig into — what else? — the history of Vermont. Organized by the Vermont Historical Society, this year's expo falls on June 18 and 19. 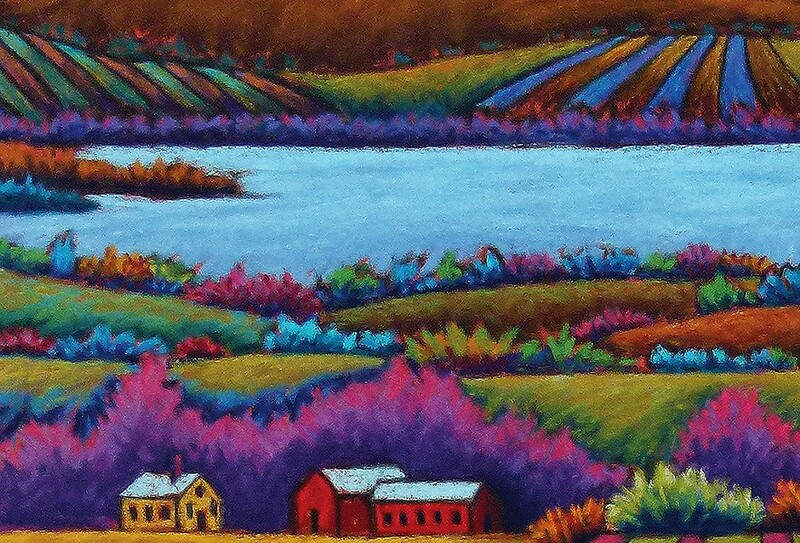 The VHS has just announced its signature artwork for the event: "Lake Champlain," a pastel landscape by Huntington artist Daryl Storrs. Her image is fitting for this year's theme, "h20: The Power of Water in Vermont History." She created the work in March 2015, expanding from plein air landscapes made during the warmer months. This one is a view of the Champlain Valley viewed from a friend's home in Charlotte. "I tend to do [a lot of] pieces of Lake Champlain, because I live in Huntington and it's a great excuse to go look at the lake for a day," Storrs told Seven Days. Regarding her selection by VHS, she said she's appreciative of "the positive exposure in helping to promote and support a good cause." Storrs apprenticed with renowned Vermont printmaker Sabra Field in the early 1980s, after graduating from Middlebury College. She received her MFA in printmaking in 1984 and eventually put down roots in Huntington, where she has worked from her barn-turned-studio for more than 20 years. In addition to pastels and printmaking, Storrs is known for her lithographic landscape jewelry.